The WooCommerce Bundle Rate Shipping Plugin allows you to provide special bundled shipping rates when a customer purchases multiple items. You can also add additional layers for each category, adding a degree of complexity that you may find suitable for your store’s situation. For example, if you sell books, you could charge $5 for the first book, $2 for the 2nd, 3rd and 4th books, and nothing for any additional books purchased. Books: $5 for the first book, $2 for every book thereafter. In this case, if a customer were to purchase two books, their shipping cost would be $7 ($5 for the first book, $2 for the second book). If another customer were to order 4 DVDs, their shipping cost would be $7 ($4 for the first DVD, $1 each for the other three). New in version 1.3.3: Frank’s shop uses a standard bundle rate configuration just like Jane’s shop above (exampe 1), but with one very important difference: When customers purchase over $100, he offers free shipping. WooCommerce 2.6 introduced Shipping Zones and the ability to use multiple instances of the same shipping method. If you started using Bundle Rate Shipping on or after WooCommerce 2.6, you can take full advantage of WooCommerce’s Shipping Zones feature. You can also add multiple instances of the Bundle Rate Shipping method to a single Shipping Zone. If you used Bundle Rate Shipping prior to WooCommerce 2.6, the plugin will continue to work as it did before. You cannot use it as a shipping method for Shipping Zones. This is to avoid losing your existing Bundle Rate configurations. However, if you would like to switch to using Shipping Zones instead, you can do that using a small helper plugin that is included in your download package from CodeCanyon. Look for the zip file called v2-upgrade.zip and install that in the same way that you installed Bundle Rate Shipping. You will need to re-enter your bundle rate configurations for each shipping zone. You will need to re-enter your bundle rate configurations for each shipping zone. This plugin does exactly what I needed it to do. I can apply it to two categories and leave flat rate shipping on the other categories. Brilliant! Thank you!! Just wanted to say, as others said, this is a GREAT plugin! You guys are saving our lives here on this one. Such a simple plugin that is super powerful. Props to the Studio! Eric was fantastic in providing his support for integration into a complex site. His service went above the bar and expectations. I was extremely impressed at his willingness to followup, test and integrate to adapt to the WooCommerce installation I had. If ANYONE is on the fence on this plugin, you should invest the money and do not hesitate. the product worked great and seemlessly on a site with over 887 products and 52 categories. Extremely happy!!! Fixes a fatal error that happens in select circumstances when WooCommerce is deactivated. Fixes a bug that caused the shipping rate to be calculated incorrectly when the “Apply base rate once” was set to No. Fixes a fatal error that occurred when installing the plugin with a version of WooCommerce prior to 2.6. Fixes a bug that prevented rates from being saved with $0 as a Cost value. Fixes issue with being unable to add new layers or configurations when using the plugin with WooCommerce Shipping Zones. Fixes a bug that caused the bundle rates not to be available in certain instances when virtual products were in the cart. Fixes a bug that caused issues with the drop down list of countries. Fixes a bug showing a disabled Add Layer button when adding a new configuration. Added woocommerce_brs_shipping_total filter. 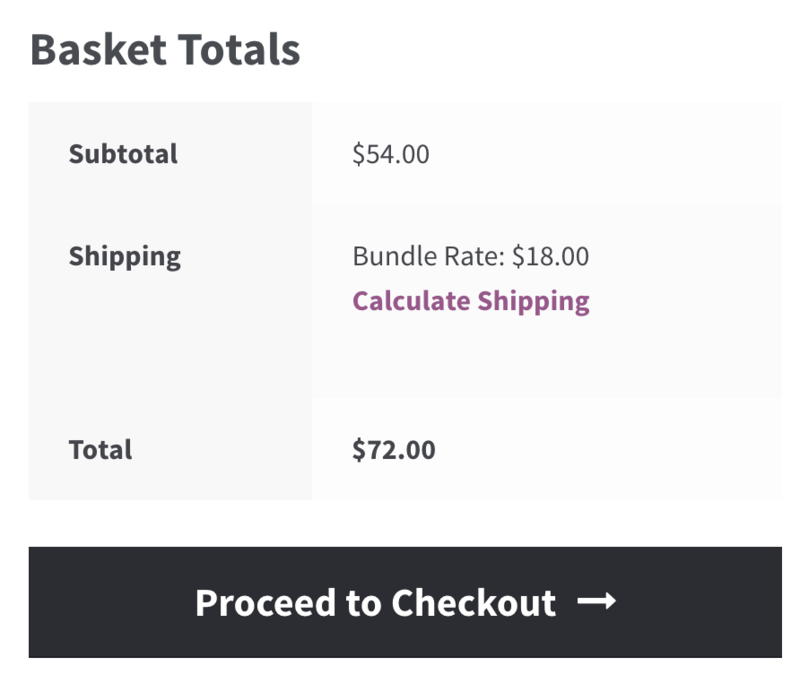 This allows themes/plugins to override the shipping total calculated by bundle rate shipping. Added woocommerce_brs_shipping_configurations filter. This allows themes/plugins to override the configurations used by bundle rate shipping. Added the ability to set bundle rate configurations on a per-state basis for certain countries (United States, Australia, Canada + others). This has been requested a number of times, and to those users who have waited patiently for this—thank you. Prevent virtual products from being counted in shipping calculations. Update to Woocommerce 2.0 + compatibility. This version will not support any versions of Woocommerce prior to 1.5. If you are purchasing the plugin new and need it for an older version, send me a message and I can send you the last stable working copy for Woocommerce versions before 1.5. Fixed a bug occurring after configurations have been removed. Added woocommerce_brs_apply_base_rate_once filter to change how rates are calculated when products from multiple categories are purchased.